This is so pretty! Love the colors and your sentiment circle. You always make such beautiful cards. I love cupcake stamps! They always seem to find glitter with me :) love your card Nancy! DARLING CARD! Looks like a cupcake shop! I never get tired of that paper, wish it was still around! Thanks for the inspiration! Oh my gosh!!! You and I must have ESP or something. Without giving away too many details, my GSG swap card is similar in several ways to yours!!!! The colors aren't exactly the same, but somethign I thought I was being original with you did on your card!!! Not sure if you're in that swap with me, but I'll be posting the card to my blog after the swaps are returned so you can see it then. I LOVE your card - the layers are perfect and the DSP from that Scrappin' kit is one of my all-time faves. Take care! I LOVE your cupcake card!! It's just so cute with the scallop overhang. TFS!! Wow Nancy great job with this card. Love the cupcakes stamps and also the colors. TFS. I think this is just perfect as it is, Nancy!! 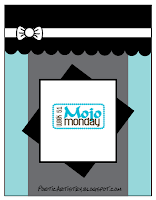 I love the papers, your yummy cupcakes, and adorable sentiment circle!! super adorable !!!! 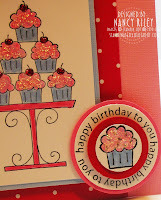 !i just love the colors and what you have done to the circle tag, nancy !!!! Please visit my blog for your award. Super cute card - Nancy!!! Great take on the Sketch and the colors are sooooo pretty!!!! Very pretty cupcakes!! Love the colors and that striped paper for the *awning*! This is adorable Nancy! I LOVE that new cupcake set and wheel! Your color choice is perfect for this set! 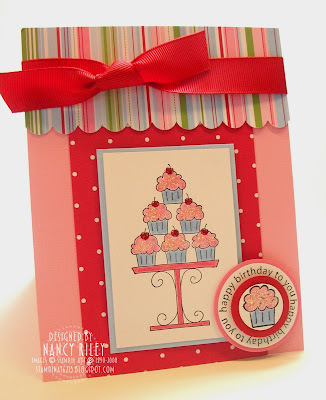 This is so cute...the striped paper with scallop at top reminds me of an awning and your cupcake image looks like the "window" of the little "store front". You always make such adorable cards! Cute, cute card!! Love the cupcake set & papers. This is gorgeous Nancy! I love the colors and layout! The glittery cupcakes look so yummy! This card screams sweetness Nancy. Love the colour and paper choice. I love how you made the circle out of the curved greeting! This is so pretty and cute!